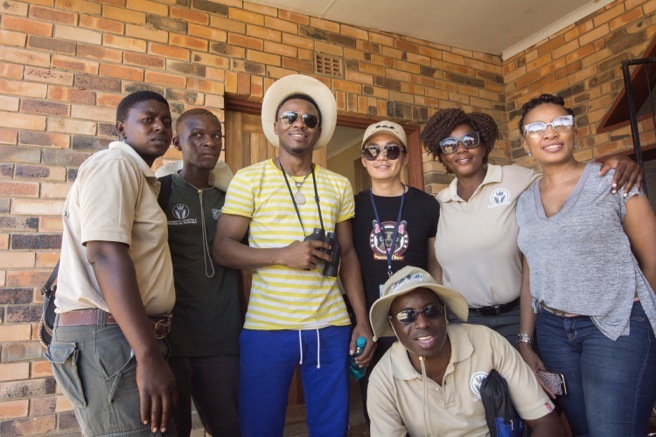 Tanzanian singer-songwriter Alikiba traveled to South Africa this week ahead of the Forum on China-Africa Cooperation Summit to take part in the China-Africa Dialogue Series, hosted by AWF and the Aspen Institute. Do most Tanzanians know about the extent of the elephant poaching in their country? No, they don't. Just like I didn't before I became a wildlife ambassador. Such information is not well documented or publicized. However, I am confident that all Tanzanians and the world will soon know of it through my voice. Do you think Tanzanians care that elephants are disappearing, or is this an issue they feel doesn’t impact them? They do care, even with the limited information they know or receive. They care that our elephants are being poached. They care that they are becoming extinct. They care that it is affecting our economy. They care that other countries are taking advantage of our animals and our heritage. They want answers; they want solutions; and they want to be part of the solution. If they aren’t aware of the problem, or if they don’t care, how do we as a conservation community or how do you as a musical artist help raise awareness and concern? They know and they will keep knowing more each day. We just need to also find ways to get them involved. What was your first experience like seeing elephants in the wild? I was terrifed. I was born in the city so I have always been a city boy. Visting the national parks was scary enough, and when I encountered the elephants I was terrifed. In time, though, I began to understand what I heard about them. They are one of the friendliest and most humble animals, and it's devastating to hear what they are going through. Were you interested in wildlife before joining the WildAid/AWF campaign, or did you know about the wildlife threats before joining the campaign? I always had love for animals since I was a child. I had pets, dogs and cats mostly. I didn’t know anything about the wildlife, but I was instantly interested in being part of AWF/WildAid campaigns and becoming an Ambassador in Tanzania. What would you like fellow Tanzanians, and all Africans, to know about elephants, lions and other wildlife? Why do you think they are important to protect? I want them to know so much but let's start with this: First, our animals need to be protected by us. Second, we are responsible for our animals as they can't protect themselves as we assume they can. Finally, let's not be scared to get involved in protecting them. We all need to be involved. We know that much of the ivory taken from poached elephants ends up in China and Hong Kong, two of the largest ivory markets in the world. In South Africa you participated in a China-Africa Dialogue Series ahead of the FOCAC summit. What role do you think China can or needs to play in protecting Africa’s wildlife? First and foremost, I would like to thank the Chinese government for being so involved so far and encourage them to continue to get involved. One of the best solutions we are pushing for is eradicating the ivory market in China and Hong Kong. The campaign, "When the buying stops the killing can too," is what we are striving for, and I would request China to keep enforcing this message and the law. Kathleen joined AWF in 2009 was AWF's Media Relations Manager. Many moons ago she worked at a wildlife sanctuary near the Kruger National Park in South Africa where she slept with monkeys, fought bush fires, led snare patrols, guided camping trips in the Kruger and spent untold hours removing cattle fencing. She has traveled throughout Southern and East Africa and looks forward to the day when she can take her own little (human) primate to visit the mother continent.